I was planning to post another recipe today but Hubby loved our Sunday dinner so much that he insisted on this. But before giving the recipe I would like to share the small story attached to it. When I came back from the hospital with the baby my Maa and MIL both were there. Post delivery diets are supposed to be healthy and certain restriction of ingredients are also there. Following which MIL cooked the food very healthy, almost devoid of any spice. I knew a new mother has to eat healthy and light but I like my food tangy so it tasted almost bland to me. Those days I used to have my meals reading cookbooks or watching cookery shows on TV. Those gorgeous pictures helped me eat my meals with ease. One such day while having rice and soy chunk stew for dinner I watched Culinary Asia, a food show featuring the cuisine of different Asian countries. That day they were showing Malaysian food and a lady cooked Laksa, a spicy prawn, tofu and fish ball soup with coconut milk. The final outcome looked so pretty and appetizing that I asked startled MIL (who also was commenting on its bland taste) to serve me more stew. I made a mental note of trying it sometime later. Then with the baby growing up and becoming naughty day by day I forgot about it. recently Hubby went to Malaysia and fell in love with their cuisine (it almost always happen with his trips abroad :-)),he loved their spice foods so much that for the first time he brought some ingredients like Chinese aromatic oil, Pad thai noodles etc from there and asked me to try them. 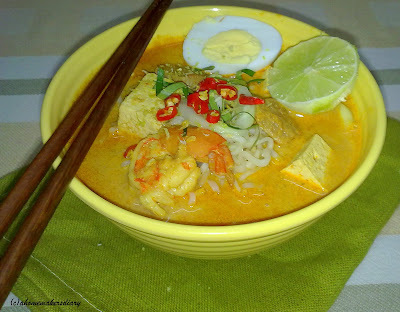 It reminded me of Curry Laksa and somehow instantly i started craving that spicy wholesome soup. 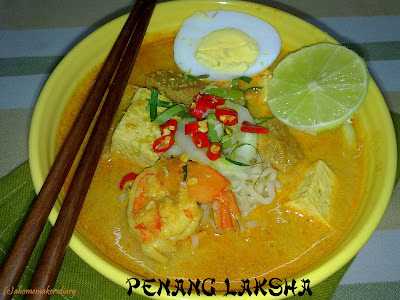 I googled and got the best looking curry Laksa on Leemei's site. She has an amazing collection of Asian recipes with yummy photos. I had adapted the recipe from Leemei’s but also experimented a little bit to get a similar result as seen on TV. I would say this is my version of Curry Laksa, adapted to the availability of the ingredients and also to our taste. If you want to try the original one go here. Here are the changes that I made. First, we dint have fish balls so I replaced it with Soy Chunks as the texture and look resemble a lot and its healthy and vegetarian. (Or probably the hangover of that soy stews,). I dint use chicken or clam. For fermented shrimp paste I used freshly fried shrimp which I later grounded in a mixie and replaced lemongrass with fresh lime leaves. By mistake I tipped in some turmeric which has made it look so yellowish. Next time I won’t repeat this and will get that gorgeous red colour and would definitely swap the picture then. And was my experiment with this long standing recipe successful??? You bet. It was a sensational dish with a burst of flavors and taste. In every spoonful of this creamy soup you taste the heat of chillies, sweetness of the coconut milk and tanginess of the lime juice. This healthy, wholesome, one dish soup is perfect to warm you up in this chilly weather. Hubby simply loved it and before finishing his meal enquired when am making it next. So all you spice lovers go make your own bowlful and enjoy this utterly delicious meal. I used 1/2 of a fresh coconut. Scraped and boiled it with 1 cup water, strained to get the thick milk. Again mixed another cup of water and strained for the thin milk. If you get readymade coconut milk use 2 cups of that. Vegetable stock cube: I used Maggi vegetarian stock cube. You can also use chicken stock. Soak the soy chunks in 1 cup hot water for 10 minutes. Wash under running water, squeeze and cut in medium sized pieces. Peel and chop the cucumber, cut the lime leaves in stripes. With the stock cube boil beans and noodles with 11/2 cups of water. I micro waved it for 10 minutes. Drain the water and reserve it for the broth. Lightly fry the shrimps with salt. Take out a few and add the boiled stock. Cover and let it simmer on low flame. In the mean time grind all the items for paste along with the taken out shrimps. In another pan heat the oil and add the paste, sugar and salt. Fry it on low till oil separates at the side.tip in the soy chunks and tofu. Cook for 3-4 minutes. Now, add the thin coconut milk and stir to mix everything well. Add the lime leaves and cover. When it starts to boil add the thick coconut milk and again mix. After a couple of minutes add in the prawn stock and the boiled beans. Check for seasoning and again bring it to boiling point and your broth is ready. Serve the Laksa with boiled noodles, boiled cut eggs, chopped cucumber and lime wedges or boiled and shredded chicken, sprouts, clams etc. Mix everything together, squeeze some lime juice. As the lady correctly commented it’s almost like a treasure hunt in every spoon full. We swirled our spoons, dipped it in the soup and checked each other’s spoon to see what we got. We giggled and devoured the soup like little kids. What a gorgeous looking curry. Love the name. Delicious I bet. Wao..thank you so much for this recipe, I am craving to make it now that I have learnt it from you. During my stay in Malaysia, I used to eat this kind of soup quite often. In Malaysia every body eats at food court few cook. The absence of fermented fish sauce will make a bit difference, but who cares? I am going to make it soon. Fantastic dish, had it when we went to Singapore, thanks for sharing this tremendous dish...tempting dish! 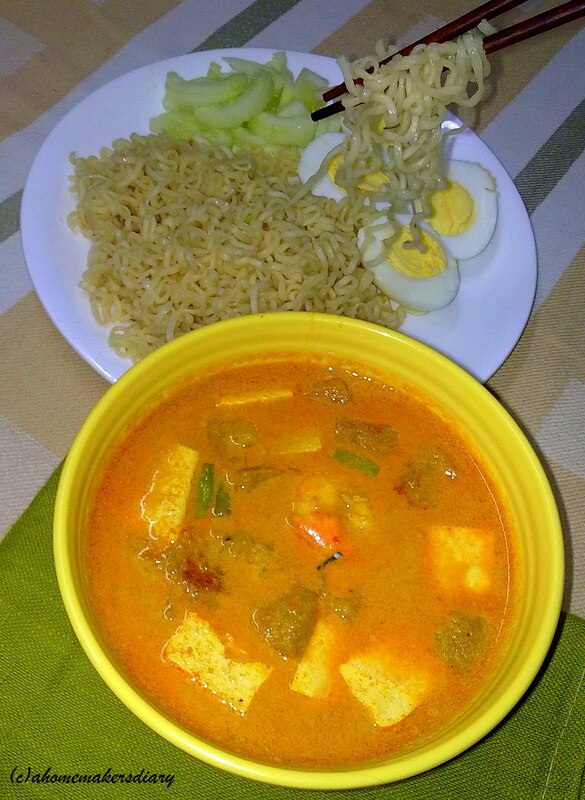 wow that looks awesome,lovely pic..thanks for sharing the recipe..
thanks Indo, Sushma and Priya. that really tasted heavenly. Ushnishda, abossoi fermented fish paste ta dile better hoto kintu ami sabe mach khaoa shuru korechi ota bodhay handle korte parbo na :-). tabew darun khete hoeche dishta. 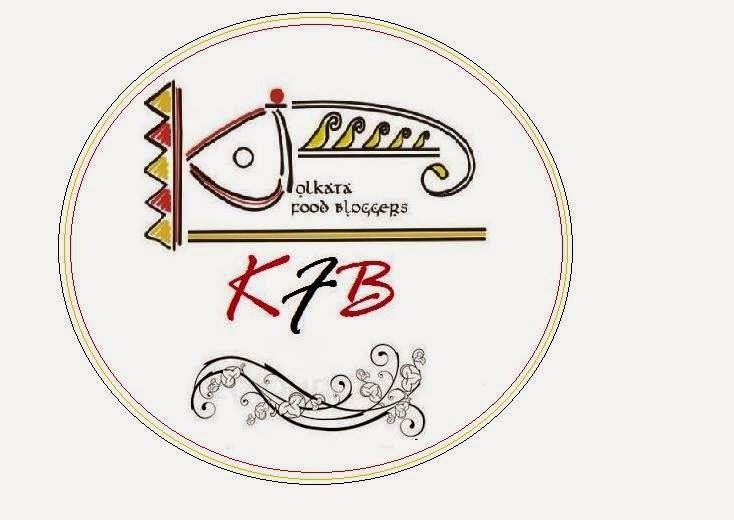 Just forget about the fermented fish paste..I wont prefer it at all if I use your method.. I have few kinds of Thai and Malay fish sauce or paste..my daughters like it. I dont use it at all. this looks so beautiful! I am drooling over your pictures :) I love Malaysian/Thai foods and this one for the winter we are going through is such a winner! 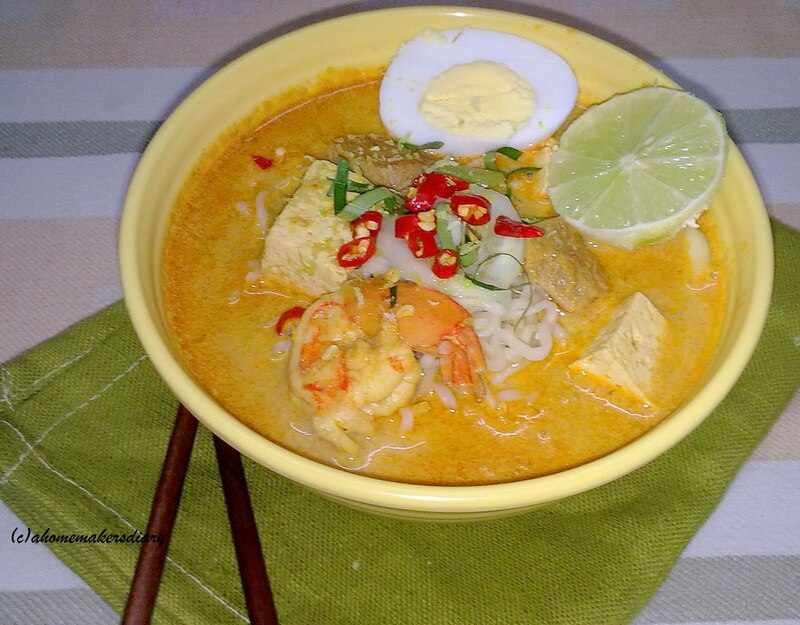 Adding soy chunks to this laksa is a great idea to sneak more soya in our diets. Sayantani... your pictures are just killing me..
i have seen tis dish on TV as you said and has been on my to make list...this recipe will come handy for sure. 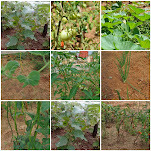 about the soya leaves , they are in season n are available in plenty these days , though i see that they are not stocked into the swanky stores n i find them with the roadside subziwallas , same for the garlic greens. i keep some soya leaves chopped in the freezer for later use too , there is still time to freeze them though..
First time here in your wonderful beautiful space. Love this Curry Laksa and the story behind it. Beautiful mouth watering clicks. I'm all open to trying recipes from different cultures. Going to bookmark this. Thanks for taking time to visit my blog. All the entries are so perfect, making one' hungry:( Pictures are splendid. Never tried any Malay food so far...very tempting to give it a shot'. B/n thanks for the warm comment at my space, dear. It means so much to me. Was in dilemma to write or not to write the intro' part. I like your anecdotes too:) Agree, it reflects our personality. @Anna, thanks for your visit, loved your place too. @PJ, you are right. we need to add more soy and this tasty dish is one of the best ways to do so. @Sandeepa, thanks!chele bhsishon dustu setao nischai chobi dekhe bujhte parcho. 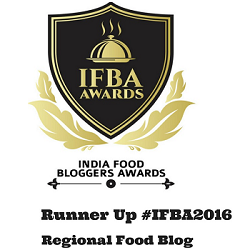 @Malar, thanks for giving my first blogging award.